This inflatable game is always a hit at any event! 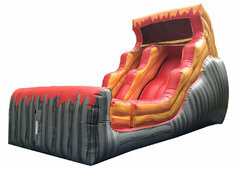 It may be used wet or dry & it includes spacious jump area, basketball hoop (inside), challenging wall climb & tall slide . With all these choices the children will be engaged for hours. 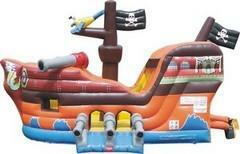 This rental is a dry option, if you would like a waterslide option, please see waterslides and combos! Enjoy Lava Rush with a double drop. Your friends and family will love this new slide and enjoy the event! Tidal wave features a double drop and 18' swift slide! We are so excited to add it to our inventory and bring you the most excitement we can! 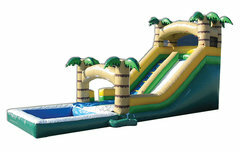 Enjoy this fun tropical slide with an extra wide slide base! Pool is removed for dry rentals. 33x13x16 set up space. Can hold 6-8 youth age riders wet or 4-6 riders dry. *600 lb. maximum at any time. Our colorful combo is sure to make your party a success! The unit features a slide, 13x13 bounce area and inflatable basketball hoop. The unit measures 30x15x13. Time for a slice of pizza and some jumping ninja action with Raphael, Michelangelo, Donatello and Leonardo in this giant Teenage Mutant Ninja Turtles bounce house combo. 5 bodacious activities in 1 mega moonwalk including a Ninja Jumping Area, Action Climbing Ladder, 8 ft Slide with Ramp for little ninjas, Basketball Hoop, Horizontal and Vertical Obstacles. Invite your ninja friends to your party for a totally tubular time! *No ninja kicks or pizza allowed inside the bounce house, play safe. For the first time in forever your kids can have the Disney Frozen themed party they’ve been dreaming about! This huge Frozen 5 in 1 combo moonwalk packs as much fun as possible into one very cool inflatable. 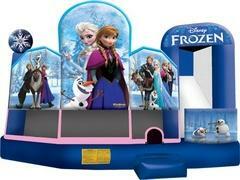 Make your next party as unforgettable as the Frozen movie with this combination adventure bouncy castle. Do you want to build a snowman? I’d rather play inside this Frozen moonwalk! The Disney Princesses are sure to bring some magic with this licensed 3D 5-In-1 combo! 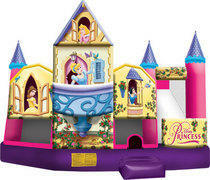 With its sweet 3D imagery, this combo-style bounce house is a home for classic princesses Belle, Snow White, Cinderella and Sleeping Beauty. Your little girl will enjoy reigning over their castle, while the boys can play the part of the gallant prince! This castle features a realistic 3D balcony for Cinderella. The large interior jumping area offers a basketball hoop and both log and pop-up obstacles. This bouncy castle has a climb feature and a convenient exit slide for hours of active fun! Parents and spectators are offered a clear view with the 360-degree mesh sides of this moonwalk. This 3D 5-in-1 bouncy house is sure to make any indoor or outdoor event a great success! Calling all Superheros! Superman, Batman, Flash, Green Lantern and Wonder Woman!!! 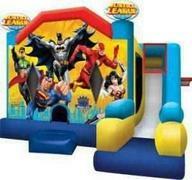 This Justice League 7 in 1 combo is the perfect bounce house for little superheroes everywhere. The Justice League is out in full force, as participants can play alongside the Green Lantern, Superman, Batman, Flash and Wonder Woman in this entertaining bounce house. This super bounce house lets visitors practice their best superhero moves with seven different activities inside the spacious moonwalk. This amazingly realistic pirate ship will have your kiddies plundering on the high seas in no time. Climb aboard and bounce in the ample jumping area, battle through the pop-up obstacles or enjoy the climb and slide located at the stern. This combo unit boasts impressive three-dimensional artwork, with a traditional pirate skull and crossed swords at the bow and ship's flag, along with a lookout on the mast. The Pirate Ship combo is sure to please any landlubber! 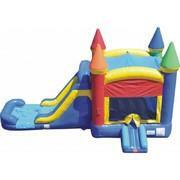 This Maroon and White Bounce and Slide Combo has 3 fun activities in 1 infltable unit. 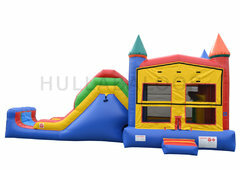 It includes a 15x15 bounce house with a wall climb that leads to a fun slide out. All materials and craftsmanship are 100% USA. Perfect for game day, tailgating, graduation, ring dunk, or for any celebration for the Maroon and White enthusiast. Your child's birthday will be forever remembered with the all-inclusive bounce & slide Rainbow Combo. An enclosed entrance helps keep track of how many children are inside the bouncy castle. The inside of the large bounce house features a basketball hoop for jumping basket fun, and the outside has a hoop as well for the guests waiting to enter the bounce house. 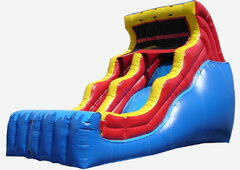 Jumping, bouncing, climbing and sliding fun guaranteed. The Rainbow Combo is the perfect addition to any backyard celebration. Our 4-in-1 Inflatable Combos feature a jump and slide with landing, climbing area, and a basketball hoop. This single unit will easily fit into most backyards and areas with limited space. The jump house is equipped with a basketball hoop for practicing slam dunks. Once the kiddos have had enough bouncing for the moment, the wall climb will lead them to a fun slide out. The slide is guarded with high inflatable walls and an inflatable bumper at the end. This Camouflage Battleship Slide measures 14 feet Port to Starboard, 31 feet bow to stern, and peaks at 18 feet. Perfect for Memorial or Veterans Day, 4th of July, or any celebration!